I was shattered when I got home from work yesterday, so I was happy to have a quick and easy dinner planned. 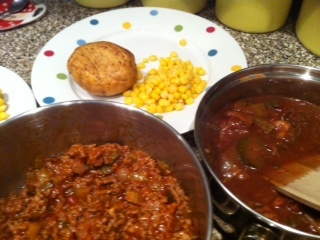 Jacket potatoes with leftovers from the freezer; in this case some bolognese sauce and/or beef casserole. It may sound an odd combination but it was filling and tasty. A can of Smart Price sweetcorn ensured at least one of our five a day. With a little planning it is so easy to make a meal of leftovers. I rarely throw food away. Even small amounts of mash or veg can be frozen to use to thicken soups and stews. Wrinkled apples make an excellent puree to mix with yogurt or serve with custard. Bread pudding is better made with stale bread (and I use the crusts). I also whizz up slightly stale bread into breadcrumbs and leave a bag in the freezer – you never know when you might need these. If yogurts are getting near their use by date I freeze them – when the kids were small I would put a lolly stick in the bottom of small fromage frais pots for a treat on a warm day. If I roast a chicken I usually deliberately get a larger one than I need and turn the excess into curry or make a creamy chicken pasta sauce. The carcass goes back into the freezer and when I have a couple I make stock. I ignore best before dates (and frequently buy from Approved Food, which sells food near or past its best before date at a hugely reduced price. In addition, I use my eyes and nose before chucking anything out that has a use by date. If you use my referral link I will earn a small commission. I shop with a list and always have at least a week’s meal plans, so I don’t buy food that won’t be used. I do a regular stock take of my fridge, freezer and larder to see what needs using up, then plan meals around what is there. If I am working late, my plan will take that into account and I will either throw a meal together in the slow cooker or defrost something from the freezer. This way I am never tempted to get a take away when I get home late and tired. We will also eat something healthy. I never guess how much rice or pasta to cook – I always measure 3 ounces of pasta and 2-3 ounces of rice, depending on how hungry we are. Sometimes I cook too much on purpose so that I can take some for lunch the following day. It is shocking what people throw away, not just because it is a waste of money, but because it seems immoral to be so cavalier about food when so many people in the world don’t have enough. There is lots of information, guidance on how to avoid wasting food and recipes at Love Food Hate Waste. If you have stale bread to use up, here is my favourite bread pudding recipe, from my trusty and ancient Cranks Recipe Book. They don’t sell this fab book any more but Amazon has the one below, which according to the reviews has a fab selection of classics from the original (disclaimer – this is an affiliate link). Break up the bread and place in a mixing bowl with the milk. Leave to soak. Add the dried fruit, butter, suga and mixed spice. Beat well. Whisk together the egg and milk and add to the bread mixture. Turn into a greased shallow ovenproof dish, level the surface and sprinkle with ground nutmeg. Bake at 180 C (350F/Gas mark 4) for about 45 minutes, until set (in my fan oven 35 minutes will do). Really delicious!! There are more ideas for how you can make a meal of leftovers, here, here and here. I’ve been saying for years that I am the Queen of leftovers – happy to share the title with you, Jane!! I freeze even the tiniest quantities of leftovers so that they can be used in something else and I often make pies with ‘interesting’ fillings. Leftovers and improvisation are two of my favourite foodie words! Like you, I HATE wasting food. Today we ate a sort of Spanish Omelette/Tortilla (lots of leftover recipes start with ‘a sort of…’ ) which contained yesterday’s leftover potatoes and runner beans and a tomato/onion/courgette mix from the previous evening. I mixed it all together with three eggs, chilli flakes and other sprinkles of seasoning and baked it in the over. We have just eaten it with salad and very tasty it was. I am horrified that my daughter buys a cooked chicken from Tesco and just uses the breast. The cats get some of the other meat and the rest gets thrown away. My sister is the same!! I had to stop her chucking half a chicken in the bin and took it home!! Your dinner sounds delicious! I plan meals around leftovers either as they are, remaking them into something new or freezing them for future meals. I hate food waste and get so mad at myself when I let something go bad. I find leftovers are usually the best bit!! I too hate food waste and try really hard to waste as little as possible. I love the recipe for Spiced Bread Pudding. I usually make croutons or garlic bread out of my home baked loaf ends for the freezer but this will make change to crumble which my three often get when I use of soft fruit plus a tin of peaches.